All-in-one power tool includes the most popular case preparation accessories in one unit driven by a single high-torque, low-RPM motor ideally suited to case prep work. Nothing else to buy to get started! Quick, easy cleanup, too - just brush all the brass chips into the removable collection pan. 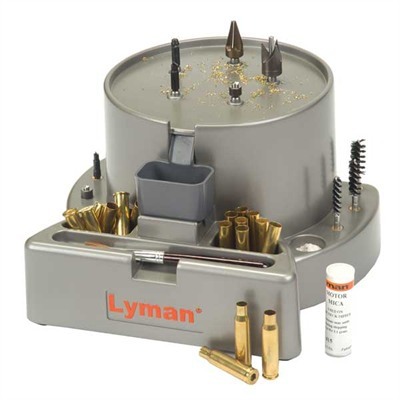 Includes attachments to perform these case prep operations: deburr case neck inside (VLD) and outside; clean/lubricate case neck; clean/uniform primer pocket and ream out primer crimp on military brass (includes attachments for both large and small pockets). Comes with case neck brushes in .25, .30, .38 and .45 calibers, plus Mica case neck lube and a handy clean-up brush. SPECS: 125 rpm tool speed. Available in 110 or 230 volt model. 230V comes with a proprietary plug for international.